The Circus Maximus was a stadium for chariot races and other games in ancient Rome. It is centrally located in the centre of Rome then and now. It was an oval arena with a gigantic length of 600 metres and a width of almost 150 metres. Around the Circus Maximus there were large grandstands, which in their greatest time offered space for about 250,000 spectators (in the 1st century A.D.). Already in the 6th century before Christ competitions took place here. In the 1st century before Christ, at the time of Caesar, the Circus Maximus (Italian: Circo Massimo) was extended. Around the long racecourse places for spectators were created. A moat was built between the spectators and the track. It was supposed to protect the spectators. The 600 metre long circus was not only used for car races. Hunting games with wild animals were also held here, including tigers, lions, giraffes, elephants and other exotic animals. But also native animals like wild boars or deer had to be hunted frequently in the Circus Maximus. There were also long-distance races and other athletics in the ancient arena. The famous gladiator competitions were also held here, although not as frequently as in the nearby Colosseum. Races and games took place in the Circus Maximus for about 600 years, until about the 6th century AD. The Circus Maximus still exists today in full size. But most visitors are rather disappointed. Little of the former venue has been preserved. You can still see the shape of the former gigantic arena. Where the spectator terraces used to be, there is now a hill to the left and right of the 600 meter long sides. The large square is now covered with grass to a large extent. 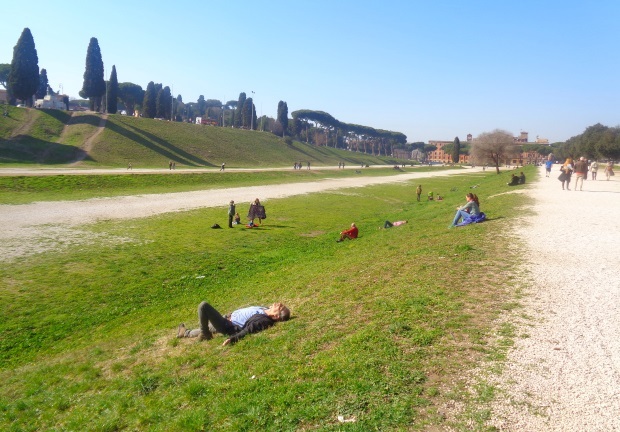 An ideal place in warm Rome to lie in the sun or for a picnic. From the former buildings and grandstands almost nothing is preserved. The Circus Maximus is an open space in the middle of the city of Rome. The Circus Maximus does not cost admission, there are no opening hours. Sometimes big events like concerts (rock etc.) with several 100.000 spectators take place here. Parking is not very easy in the centre of Rome, you go better with the subway (Metro). Circus Maximus has a subway stop called „Circo Massimo“ of line B. The Colosseum of Rome is only one stop away, the Central Station Termini 3 stations. Also two tram lines stop at one end of the former arena, very close to the river Tiber and the Tiber Island.